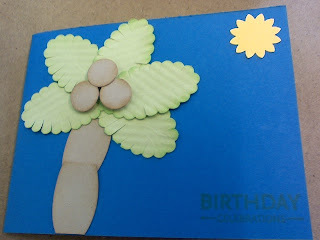 It was a luau themed 12 year old birthday party, and though many were donning lei's and hula skirts, it was my daughter who said "Mom, can you make a coconut tree." and this was 2 hours before party time. Not to panic, I got my punches out, the oval scallop and the oval and my circle punches and just made it happen.... probably because I have been thinking about this card for two days now. 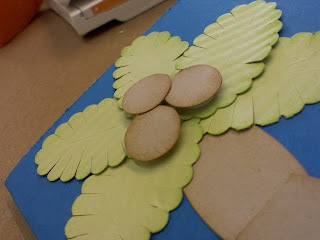 I popped the coconuts on dimensionals and crinkled the paper for the leaves. And then it was finished. 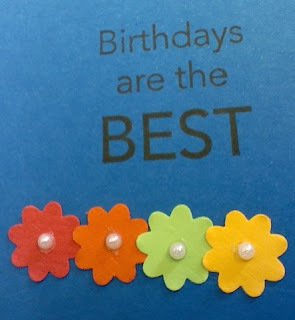 We did stamp some flowers on the envelope, in bright colors to make the card and Luau them. Your coconut tree is absolutely FANASTIC!!! What a clever idea...wish it was MY b-day party your daughter was going to!